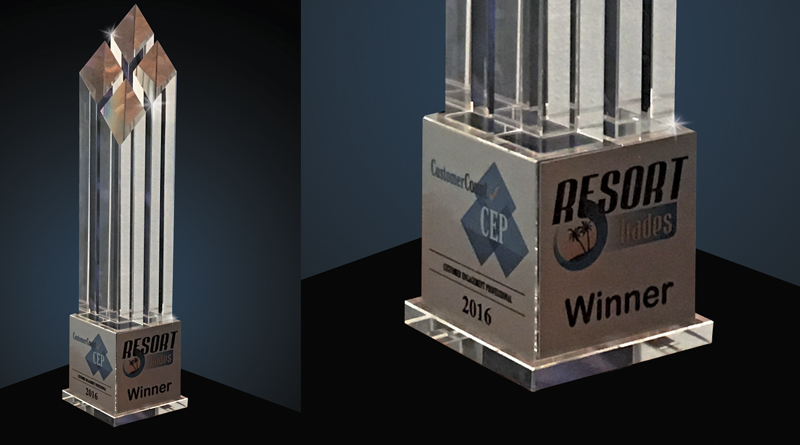 CustomerCount® and Resort Trades magazine have announced that nominations for their annual “Customer Engagement Professional Award (CEP)” will close November 24, with the winner being announced In January 2018. The coveted award recognizes outstanding leaders who exemplify customer engagement within the timeshare resort/hospitality industry. The nomination process includes completing an online nomination survey to measure the nominee’s qualifications and qualities. The survey is powered by CustomerCount’s software. Nominations should focus on the performance of customer facing individuals including Resort Managers, General Managers, and Assistant Managers who have contributed to the success of the company in an exceptional manner. Areas of contribution may be extraordinary interactions with members/guests; remarkable improvements in on-site ratings of the resort; innovative training techniques and outstanding social media mentions and reviews. Nominations must include detailed insight regarding the leader’s performance and contribution showing how the nominee’s efforts and achievements have significantly impacted the team, company, and/or community. The winning manager and their company/resort will be profiled in the January issue of Resort Trades. Two trophies will be presented; one for the company and one for the individual CEP. To submit a nomination, visit CustomerCount for a link to the entry form. Or fill out the online form . CustomerCount is a feature-rich, cloud based survey solution providing intuitive real-time reporting, fast turnaround on requested updates, and detailed and dynamic data gathering capabilities to support process improvement efforts, build customer loyalty and improve your bottom line. Developed and managed by Mobius Vendor Partners, CustomerCount was initially designed for the timeshare and contact center industries and is now used by organizations across numerous different vertical markets and industries. For more information, visit www.customercount.com or call 317-816-6000. Follow them at http://www.customercount.com/blog/ on Twitter @CustomerCount or facebook.com/CustomerCount. Resort Trades is distributed monthly to every resort in the U.S., plus major resorts and hotels in Mexico, reaching a subscriber-base of approximately 7,000 senior-level executives at development, management and timeshare-related travel companies. Original content is emailed each Thursday through Resort Trades Weekly to more than 22,000 subscribers. Resort Trades offer display advertising, classified advertising, directory listings, as well as monthly industry news and press releases, global analysis articles and in-depth interviews with industry professionals and business leaders. For more information contact Marla Carroll, 1-931-484-8819, Marla@TheTrades.com for U.S. and J. Michael Martinez, +52-1 (984) 188 6962, JMichael@TheTrades.com for Mexico.